Hi there, my darlings! We've had the weirdest weather lately in NYC...hot one day, cold the next and we're all suffering for it. Outbreaks of the flu, exhaustion, and general feelings of being "under the weather". But you know what I've also noticed? My skin and particularly my hair has been kinda "under the weather" too. I have really long, wavy hair which can be a challenge to maintain even on the best of days but this weather has been making it nearly impossible to keep it looking and more importantly, feeling healthy--if it's too frizzy one day, then it's too greasy the next. Luckily, I've been testing several new products that are easing my troubles and today, I'd like to share one such set that I'm currently loving for my hair--Mitch Stone Essentials' Lustre Shampoo and Conditioner! 456 Lustre Shampoo : Flip open the cap for a rush of the full-bodied fragrance that combines the buoyancy of pink grapefruit with the nuances of jasmine. 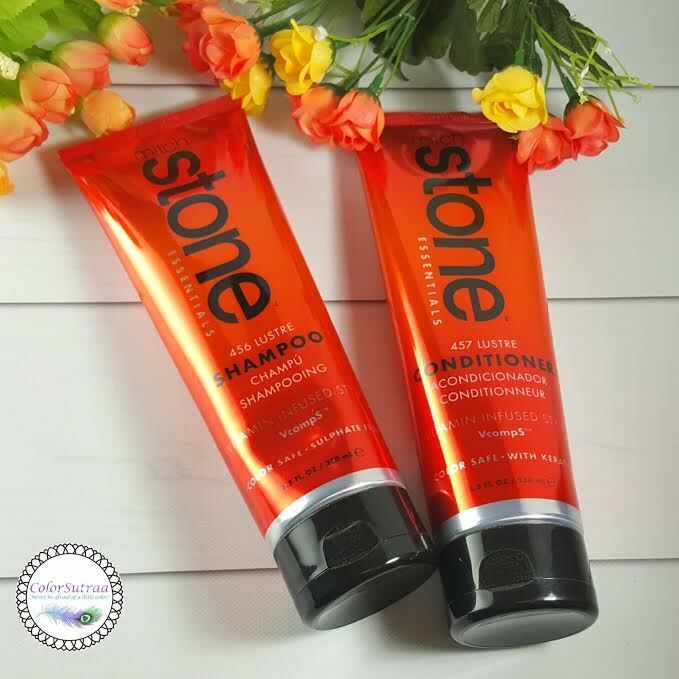 This sulphate- and paraben-free shampoo will clean hair briskly while leaving healthful oils intact. '456' is the prefix for phone numbers in Malibu, California, whose pure, nature-driven aesthete is the underpinning of the collection. 457 Lustre Conditioner : Inspired by the quintessential Californian lifestyle embodied by Malibu - 457 is the telephone prefix for parts of the beachside enclave - our Keratin-based conditioner glides on easily, washes out thoroughly and infuses the hair with an exhilirating scent created from plumeria, passionfruit and coconut, reminiscent of sun-soaked getaways. IMPRESSIONS : Let me just start off by saying that unequivocally and without a doubt...I LOVE this set! Rarely if ever do I manage to finish off any product, simply because I'm testing so many at the same time, but I know that I'll be using this til the very last drop! The shampoo is a thicker gel/cream hybrid that I haven't often encountered and my immediate reaction was "uh oh, this is gonna be so hard to wash out!" But I was proven completely wrong. Not only does this work up into a rich, full lather but I was easily able to rinse it out without any residue. What this means for me is that I needed less product to fully wash my hair and if you have long hair that eats up shampoo faster than water, that's a total blessing! The conditioner is a rich cream that easily works into the hair--again, a little goes a long way! This, too, I was able to rinse out easily and it left my hair feeling hydrated, without feeling weighed down or tacky. My first test for a shampoo and conditioner is to let it air dry the first couple of times I use it to see how it makes my hair look and feel without the use of any other styling product or without the help of a blow dry. This duo passed with flying colors. Not only did my hair feel impossibly soft and smooth with little to no frizz, but my scalp felt clean and my hair just looked full and healthy. Best part? My smelled amazing every time I used it! Like warm, sun-kissed oranges! Overall, huge thumbs up from me! 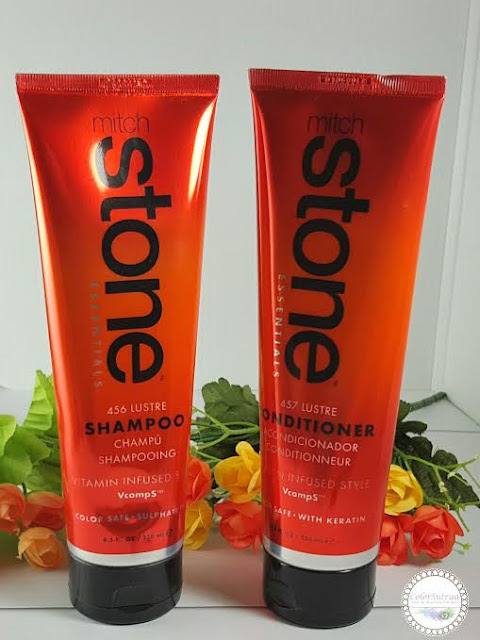 If you would like to pick up Mitch Stone Essentials Lustre Shampoo and Conditioner for yourself, you can find it on their website HERE for the price of $36 for the set.